after successful print. If the print fails, the deletion is not executed! 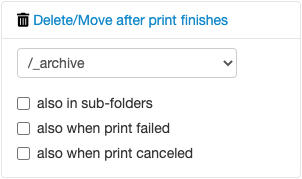 The user can enable automatic deletion after each print by using a checkbox in the sidebar. If you want to delete files after a couple of days, use the Plugin-Settings. Deletion in done while opening OctoPrint. For implementation details please visit the homepage.